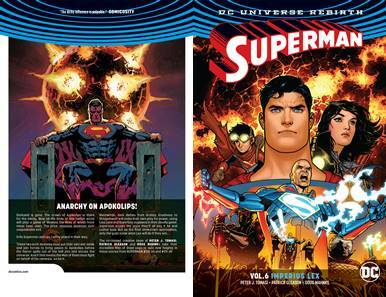 Darkseid is gone and the crown of Apokolips is there for the taking. Now all the lords of this hellish world will play a game of thrones the likes of which have never been seen. The prize: absolute dominion over unspeakable evil. Only Superman and Lex Luthor stand in their way. These two arch-enemies must put their own war aside and join forces to bring peace to Apokolips before the horror spills out of the hellpits and across the universe. And if that means the Man of Steel must fight on behalf of his nemesis... so be it. The acclaimed creative team of Peter J. Tomasi, Patrick Gleason and Doug Mahnke take their incredible Man of Steel saga to epic new heights in these stories from Superman (2016-) #33-36 and #39-41! Who is Superman? What does he value? What does he fear? And when he's pushed...how far will he go? Find out in a trio of stories that get to the heart of the world's greatest superhero! And finally, Superman's greatest fear seems to come true, as Lois finds herself the target of the super-assassin who never misses his mark: Deathstroke the Terminator. Can Deathstroke make a murderer out of Superman, if it means saving Lois' life? Find out in Superman Vol. 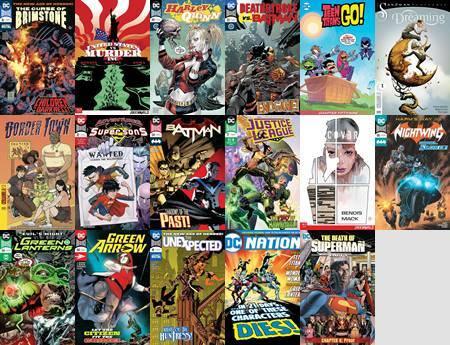 5: Hopes and Fears, from the stellar creative team of Peter J. Tomasi, Patrick Gleason, Doug Mahnke, Tyler Kirkham and more. Collects Superman (2016-) #27-32. Though Superman and his family have found a measure of peace in their adopted town of Hamilton, they've also sensed a sinister presence lurking beneath its idyllic rural façade - something, as a visiting Batman and Robin are about to discover, that is stripping young Jonathan Kent of his powers and pitting neighbor against neighbor, hero against hero, father against son. Soon the time will come for Jonathan to choose: Will he follow his father into the light of truth and justice? Or will this Boy of Steel be forever warped by the corrupting powers of darkness? Find out in SUPERMAN VOL. 4: BLACK DAWN, featuring the creative team of Peter J. Tomasi, Patrick Gleason, Doug Mahnke, Mick Gray and more! Collects issues (2016-) #20-26. SUPERMAN VOL. 3: MULTIPLICITY unleashes adventure on an epic scale - brought to vivid life by the all-star creative team of Peter J. Tomasi, Patrick Gleason, Jorge Jimenez, Ivan Reis, Ryan Sook, Tony S. Daniel, Sebastián Fiumara and more and featuring a mind-blowing array of Supermen drawn from the DC Universe's incredible history. Kenan Kong, the New Super-Man of China, has been taken. 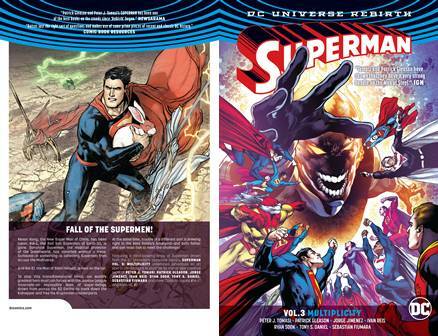 Kal-L, the Red Son Superman of Earth-30, is gone. Sunshine Superman, the mystical protector of the Dreamworld, has vanished without a trace. Someone - or something - is collecting Supermen from across the Multiverse. And Kal-El, the Man of Steel himself, is next on the list. 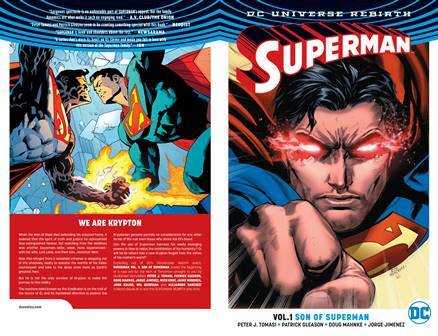 To stop this transdimensional terror, our world's greatest hero must join forces with the Justice League Incarnate - an impossible team of super-beings drawn from across the 52 Earths - to track down the kidnapper and free his Kryptonian counterparts. At the same time, trouble of a different sort is brewing right in the Kent family's backyard - and both father and son must rise to meet the challenge! 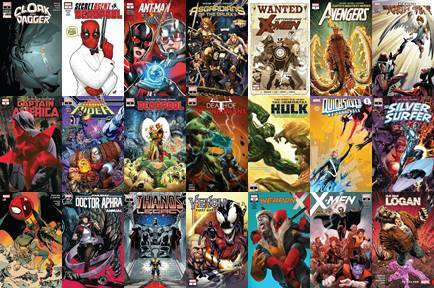 Collects issues (2016-) #14-17 and ANNUAL #1. 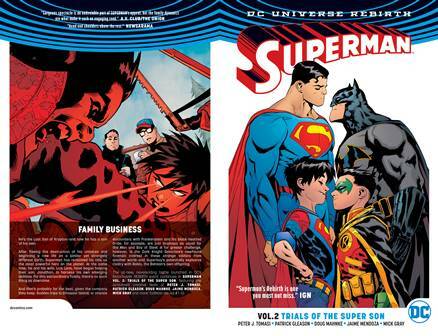 Superman and his super-son Jon are back in the second volume by best-selling author Peter J. Tomasi! With Jon becoming more and more powerful by the day, Superman's greatest foes are starting to take notice of the new super-kid on the block. When one of the most evil and ruthless of Superman's rogues' gallery comes for the Man of Steel's son, Clark must decide just how far he's willing to go to protect the ones he loves. The machine mind known as the Eradicator is on the trail of the House of El, and its hardwired directive to protect the Kryptonian genome permits no consideration for any other forms of life-not even those that share Kal-El's blood. Exploding out of DC's blockbuster Rebirth event, SUPERMAN VOL. 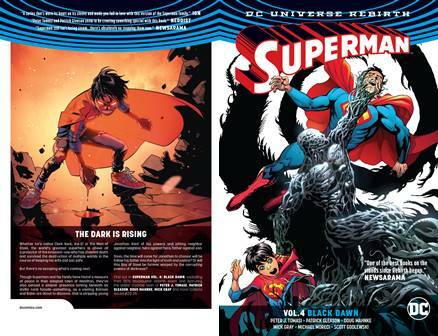 1: SON OF SUPERMAN marks the beginning of a new era for the Man of Tomorrow and a great jumping-on point for new fans-brought to you by acclaimed storytellers Peter J. Tomasi, Patrick Gleason, Doug Mahnke, Jorge Jimenez, Mick Gray, Jaime Mendoza, John Kalisz, Will Quintana and Alejandro Sanchez! 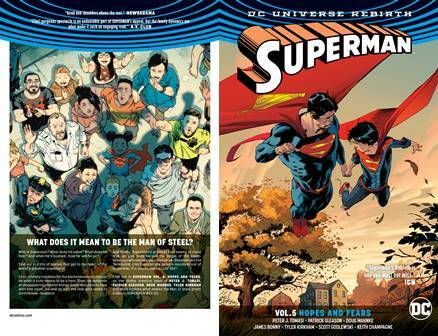 Collects issues (2016-) #1-6 and the SUPERMAN: REBIRTH one-shot. 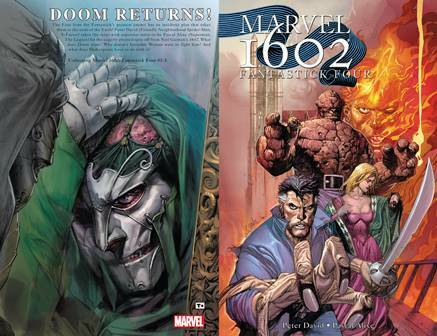 Collects Marvel 1602: Fantastick Four #1-5. Doom returns! The Four from the Fantastik's greatest enemy has an insidious plan that takes them to the ends of the Earth! What does Doom want? Why doesn't Invisible Woman want to fight him? And what does Shakespeare have to do with it? 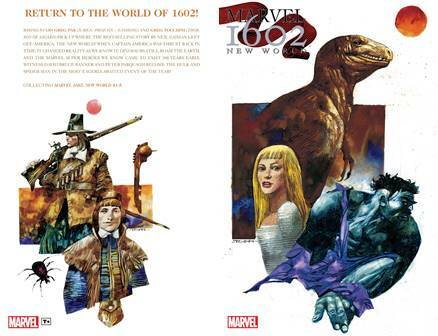 Collects Marvel 1602: New World #1-5. Return to the world of 1602! Picking up where the best-selling story by Neil Gaiman left off: America, the New World! When Captain America was thrust back in time, it changed reality as we know it. Dinosaurs still roam the earth, and the Marvel super heroes we know came to exist 500 years early. Witness David Bruce Banner and Peter Parquagh become the Hulk and Spider-Man of 1602!